Anyway, she was in my childhood the doll that came with a delay. After her release in Europe a dealer in my hometown made a special offer. I think it was back then 30DM/15€ (German marks, long gone now) and I wanted her as soon as I saw her in the ad. Later the day we tried to buy her but she was sold out. The demand was so high we had to wait two weeks until I got her. An incredible long time for a child in 1992. Many years later I sold almost all my playline Barbie dolls when I became a Teenager and I sold her because her hair was not so beautiful anymore although I never really played with her but in my early 20s I bought another Nrfb version of the doll to be sure that the hair stays in perfect condition. So that’s my personal story about my Totally Hair Barbie doll. Today Barbie celebrates her 58th Anniversary. She was presented first on the New York Toy Show in March 1959. Since then she had a lot of friends, a lot of cars, a lot of houses and lots of pets as well as horses. She gave us courage as kids to try out new things like being a female astronaut. She always was the fashion icon of the time. 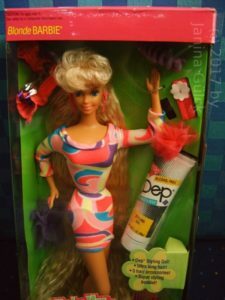 To me Barbie always had the significance of being something very positive. She had something mysterious that was also interesting. I got my first Barbie doll from one of my grandmothers. I got a Crystal Barbie (1983) and I still have her in my collection. 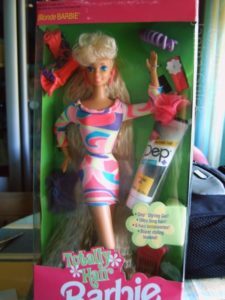 I think this was one of the first milestones in my interest in Barbie. My wish to the birthday girl is that she may be produced for further 58 years. I think she’ll have the right dress for the party in her closet. I would like to mention that Ken also celebrates his birthday this week. He’s only two years younger than Barbie and was introduced in 1961 as Ken (Kenneth). Ken was created as the boyfriend of Barbie and also introduced on the New York Toy Show in 1961. In the last weeks some researchers did some research in behalf of the Toy Museum in Nuremberg how to store old Barbie dolls the best way. The researchers found out that it is the best to store the old dolls in a cool, dry and dark environment. Here’s the link to the German article http://www.deutschlandradiokultur.de/spielzeugmuseum-in-nuernberg-barbie-forever-young.1008.de.html?dram:article_id=379793 . I don’t know if this was published in English speaking countries too. If it’s not you can use google translator for reading it.